Yeah, we have made it to the FIFTH PR Word of the Week. Clap. Clap. Clap. While listening in on a webinar called the Future of Media, learned a new word. You have heard of earned media and paid media, but what is owned media? Media/channel that is owned by an organisation or individual. E.g web site, blog, Twitter feed etc. It can be sometimes hard to differetiate between the three types of media (earned, owned and paid). And it can be overwhelming trying to figure out which one to utilize as a business. 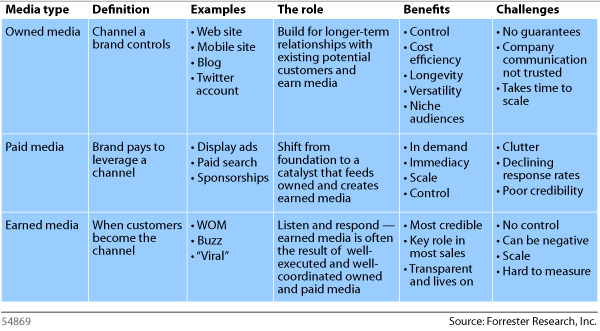 So, I have included a table below that breaks each type of media down in to benefits, challenges and examples of their use (source: Forrester’s Blog). This entry was posted in PR Word of the Week and tagged owned media, PR, PR Word of the Week by Kristine D'Arbelles. Bookmark the permalink.